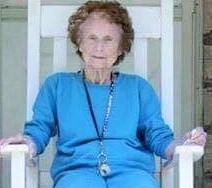 Clara Kimball (Young) Henson, age 97 of Jackson, KY departed this earthly life on Thursday, January 24, 2019 at the Hospice Care Center in Hazard, KY.-She was born October 3, 1921 in Breathitt County, KY and was the daughter of the late Bradley and Sarah (Raleigh) Young.-She was preceded in death by her husband: Charlie Henson.-One sister: Hazel Young Moore.-Two brothers: William “Sonny” Young and Glen Edward Young. -Affectionately known as Kimball, she attended Lees JR College and the University of Kentucky. -She retired from KY River Community Care Adult Center Special Education and also had worked as a Special Education teacher at LBJ elementary in Jackson, KY- She is survived by one daughter: Debra Sue Henson McKinley “Mac” Miller of Jackson, KY-One brother: Howard Eugene Young of Manitowoc, Wisconsin-Two sisters in law: Mary Young Watkins and Laura Jean Young of Jackson, KY-Three grandchildren: Michael Lindon, Michelle Miller and William McKinley “Bub” Miller.-A special niece: Debra Renee Young Fugate.-A host of other nieces and nephews.-A special caretaker: Arbutice Ritchie- Special friends: Judy and Danny Page, Teneil Mullins, Mildred Rogers, Karen Sallee and Lois Turner.-Funeral services will be held on Sunday, January 27, 2019 at 1:00 p.m. at Deaton Funeral Home Chapel with Bobby Hollon and David McIntosh officiating.-Burial in the Jackson Cemetery.-Visitation will begin on Saturday at 5:00 p.m.-Deaton Funeral Home in charge of arrangements.-Pallbearers: Claude McIntosh, Estill McIntosh, Phillip McIntosh, Earl Steven Young, Isaac Miller, Jason Fugate, Hunter Tolliver.-Honorary Pallbearers: Donald Miller, Gordon Miller, George Miller, Andrew Miller, Earl Watkins.